Gibitre has developed specific software for the control of hardness units.The program is compatible with Windows 7 and 8(32 and 64 bits). 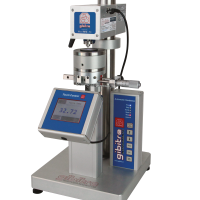 Gibitre has developed specific software for the control of hardness units. The program is compatible with Windows 7, 8 and 10 (32 and 64 bits). Each hardness unit can be connected to a standard pc using the usb cable provided. In case more units are connected to the same pc, they can be used simultaneously. The software is connected to a database where standard test procedures are stored. (hardness relaxation curve) is drawn. 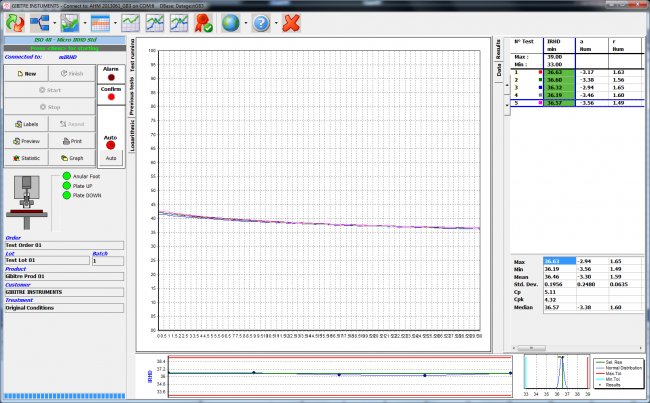 Tolerance comparison: Results are automatically compared with tolerance limits set for the product under test. of the standard test time and measuring the rate of hardness recovery after the set time. Thickness correction: Italian standard UNI 7319 has developed a mathematical correction, which permits to predict the hardness measure on a standard sample when the real test is made with a sample with non-standard thickness. Data storage: Test identification, results and hardness relaxation curves can be printed and stored in a database. Data export: the test results and the points of hardness relaxation curve can be exported both to a serial port or to a txt file for further analysis. The test results of the test finished or a selection of stored results can be printed. The test report may include, in addition to the test results and test identification, the test curves, the to?lerance limits, the statistic, the logo of the customer, the digital signature of the user and a legend with the description of the results calculated.